Place a non-stick frying pan over high heat and add the butter. 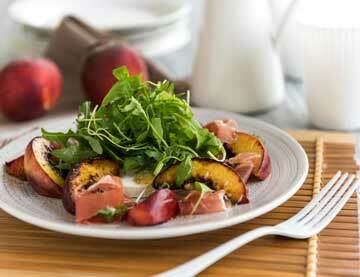 Sauté the peaches until slightly golden, remove from the frying pan and place in a small non-stick baking tray. Pour the orange & lemon white balsamic cream over the peaches, sprinkle with salt and freshly ground pepper, mix well and bake in a pre-heated oven at 190οC for 8-10 minutes. Put the frying pan back over high heat, add the olive oil and briefly fry the Manouri* cheese from both sides until it gets an attractive golden colour. On a large plate, place the Manouri* cheese in the centre, arrange the peach pieces and the prosciutto around it; on top of the Manouri* cheese put the rocket and finish by drizzling some more cider balsamic cream.